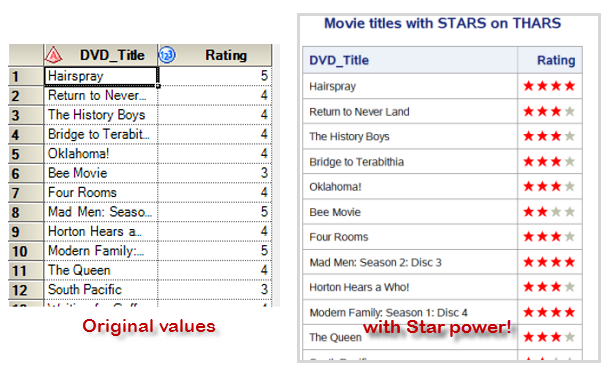 Recently a user on the SAS-L mailing list had this challenge: "I would like to display stars in a table (created by PROC REPORT) based on variable values. For example, if value=3, then display five stars with 3 in yellow, and the other two in grey." In her original post, the user had sketched out an approach that used a custom SAS format with uppercase and lowercase Xs representing the desired "star" states. It turns out that this was very close to a working approach. All she needed to do was apply the same technique that I used to add Harvey Balls to a SAS report. Like the Fix-It-Up Chappie, I'm here to offer the solution. This program should work in SAS Display Manager, SAS Enterprise Guide (select HTML output), and even the SAS University Edition (SAS Studio). +Chris Hemedinger is the manager of SAS Online Communities. Since 1993, Chris has worked for SAS as an author, a software developer, an R&D manager and a consultant. Inexplicably, Chris is still coasting on the limited fame he earned as an author of SAS For Dummies. He also hosts the SAS Tech Talk webcasts each year from SAS Global Forum, connecting viewers with smart people from SAS R&D and the impressive work that they do. Hi Chris, great post! Short and sweet. Great visual. Could please also specify how to show yellow/golden stars? Sure thing, Leonid. Simply replace "red" with "gold". I was able to run the report excatly as you posted the code but the stars were not colored. Is there a particular version of EG that I need or is there something I need to turn on. If using EG, try changing your results output to HTML instead of SAS Report (the default) -- see if that helps. Hi, Chris - we've been using this for a while (although the code CONSTANTLY evolves - now we are adding the accessibility option for Section 508 compliance and PROC ODSTEXT) and I love the stars - what would really be nice is if we could get half-stars like the harvey balls. Now, for some of my reports, I use unicode fraction symbols for the half. I read somewhere that we could possibly add symbols / create our own fonts. This would be a wonderful addition. Any clever font designers out there? Louise, looks like there is a proposal for a half-filled star in Unicode. Seems like something you could have written! Well, I have been known to find the answer to a SAS question in one of my own papers - so many (SAS) options, so little time, my brain is full? It *might* have been me, or someone in tech support (Bari/Jane E/Scott H) relaying my desire for half-stars! Thanks! This seems to work in HTML, but will this work in PDF?